We’d love your help. Let us know what’s wrong with this preview of Factory Girls by Leslie T. Chang. To ask other readers questions about Factory Girls, please sign up. I've started this book recently and I'm wondering, obviously the book is still relevant in regard to 2008-2009 China, but what about 2018 China? In the early 2000s, my brother briefly worked as an executive for a Taiwanese-owned manufacturing company in China. It was a company of truly epic proportions, employing hundreds of thousands in China and abroad, and manufacturing for virtually all the big names in consumer electronics sold all over the world. If you use an IPad or any other Apple product, it would have passed through one of its gargantuan production facilities. Its ‘campus’ in Longhua, an industrial suburb of Shenzhen, was prac In the early 2000s, my brother briefly worked as an executive for a Taiwanese-owned manufacturing company in China. It was a company of truly epic proportions, employing hundreds of thousands in China and abroad, and manufacturing for virtually all the big names in consumer electronics sold all over the world. If you use an IPad or any other Apple product, it would have passed through one of its gargantuan production facilities. Its ‘campus’ in Longhua, an industrial suburb of Shenzhen, was practically a city unto itself with massive dormitories, shops, a sports center and a hospital. Security was tight, discipline militaristic, living condition Spartan and working hours extremely long. Assembly-line pay was miniscule by first world standards, but slightly above average for China. Worker suicides were not unknown*. Once in a blue moon, the big boss, a Taiwanese self-made billionaire who scoffed at business school grads, would drop by to preach the virtues of “hard work” and four hours of sleep a day to stadium-full of employees. On certain auspicious days, everyone had to line up to pay their respect to the Tu Di Gong, the Chinese earth god of wealth, eliciting muffled objections from the Taiwanese Christians and mainlanders brought up as atheists by the Communist state. The Taiwanese executives and managers spoke Taiwanese Hokkien among themselves, a language not understood by most of the mainlanders, and looked down on their workers, migrants from the rural interior who formed the backbone of the company’s operations. After a while, my brother’s functional Mandarin became good enough to talk directly to the workers. He was impressed by their capacity for hard work and innate intelligence. Considering that these people were probably the first generation ever to leave the farm and were spottily educated in rural schools, it was a revelation to see how quickly they learned how the factory worked and to make hi-tech products according to complex instructions. After working hours, he wandered around the town, an industrial Wild West full of shops selling cheap and/or bootleg goods. You could walk into a hole-in-the-wall electronics shop and buy, say, a ‘Sony’ DVD player for a fraction of the official price. Or, if you liked the design of the Sony but preferred the specs of the Phillips --- mei wenti! No problem. They could assemble one for you. The more reputable shops got their wares from the factories that made these brands, so in a sense they were ‘genuine’ knock-offs. Everyone was ambitious, inured to working conditions that were unthinkable in developed countries, and had no respect whatsoever for intellectual property. The officials expected kickbacks, and practically anything was permissible for the right price. Currency manipulation aside, these attitudes seem to be the real cause behind China’s spectacular economic rise. This book is a fascinating, occasionally voyeuristic, study of the lives of the assembly-line workers who fueled this rise, specifically a couple of factory girls in Dongguan, another industrial town not far from Shenzhen. Chang, a second-generation Chinese American, followed each of her subjects for years, chronicling their working and private lives, collecting information about their family history and even gaining access to their diaries. Daughters, who are less valued under the Confucian system, became the primary breadwinners of the family under the new values of industrialization (sons are often required to stay in the village to care for their ancestral farms and many factories prefer young women as they are considered more diligent and easier to manage). For the first time in history, unmarried, working-class women call the shots and they are ambitious enough to make the most of this opportunity. A sweatshop job is a stepping-stone to a white-collar job in the same factory. A receptionist with a talent for public speaking can become a successful recruiter for a MLM company. Farm girls who never graduated middle school could own export-oriented SMEs. There is a darker side to all of this, and Chang is never sentimental about her girls; she doesn’t shy away from writing about the sometimes-Machiavellian ethos they employed to get ahead, or about the bogus and criminal enterprises that proliferated to take advantage of ignorant migrant workers. Between stories of the factory girls, Chang inserted her own family’s history of migration. It is decades and continents apart, for the Changs were an educated, upper middle class family that migrated to America after the Communist victory, but it serves as an interesting contrast to the experiences of today’s rural migrants. Writing about the rising China is practically a cottage industry of its own, but this book is remarkable for putting a human face on the tide of workers who powers the economic juggernaut. It seems to me that this book and both Oracle Bones: A Journey Between China's Past and Present and Country Driving: A Journey Through China from Farm to Factory by Peter Hessler, who is married to Chang, present the most honest and insightful picture of contemporary China. *Long after my brother left the company, these tragic incidents became a PR disaster for the company (and Apple). In response to this problem, the management planned to replace troublesome human workers with automatons. While being able to relate to Chang certainly is not a prereq for enjoying this book, I think I've had a different experience reading this book than non-Chinese-Americans may have. My mom grew up working in sweatshops and factories in Shanghai and Hong Kong in the 1960s and 1970s, so this book has been really interesting as a look into the generation of girls that came after her. She had limited schooling, and worked with her hands her entire life. The mentality of moving up and switching jobs a While being able to relate to Chang certainly is not a prereq for enjoying this book, I think I've had a different experience reading this book than non-Chinese-Americans may have. My mom grew up working in sweatshops and factories in Shanghai and Hong Kong in the 1960s and 1970s, so this book has been really interesting as a look into the generation of girls that came after her. She had limited schooling, and worked with her hands her entire life. The mentality of moving up and switching jobs and taking computer classes to improve your chances at a better job (and husband) seems to be what sets this generation of girls and women apart. My mother didn't go to work because she wanted to improve her life, she wanted to earn money to improve the lives of her siblings and let them continue schooling. She is of the previous generation, just like Chang's father's generation. It was really interesting how having wealth changed the migrants' roles in their family affairs. Chang mentions that for the older generation, it was not the same (i.e. getting beaten for changing your major without consulting with parents). My mother also earned a lot for her parents, not more than her father, but it only made a difference when she argued for allowing her younger sisters to continue their education.It is interesting to see how much has changed and how things are continually changing, not necessarily in a good or bad way, but just changing. p. 58 "The divide between countryside and city was the only one that mattered: Once you crossed that line, you could change your fate." "You can only rely on your self"
Some of the reviews talk about how Chang uses a lot of metaphors, or jumps from topic to topic, or delves too deeply into her own family history for the purposes of the story. I think to try to understand present modern China, you really do need to understand at least some of the history, and the cultural things that have led up to present day. I admit that at some points her narrative is a little weak, but the richness of history makes up for that and the intrigue of the modern girls' story holds up well against it. As for the metaphors, that is part of Chinese culture (i.e. the not talking openly about yourself or feelings or opinions), so if you really don't get the picture or effect she is going for, then you could try just thinking about it for a few minutes. That break in space between paragraphs is meant to tell you to take a moment and think before you barrel further into the story. This is not like your fictional novel where you just want to see what happens at the end. Part of the process is really trying to understand the people and what they are going through in these stories. There are two great reasons to read this book! One, the direct relevance it has to almost everyone alive today who consumes products of any sort (shoes, bags, cell phone parts, computer parts) made by the intrepid young working ladies of Dongguan in Southern China that the author describes in this book. Second, Ms. Chang's narrative voice was truly a pleasure to read. The material itself is fascinating and up-to-the minute-timely; the book details how a huge migration is taking place in China, t There are two great reasons to read this book! One, the direct relevance it has to almost everyone alive today who consumes products of any sort (shoes, bags, cell phone parts, computer parts) made by the intrepid young working ladies of Dongguan in Southern China that the author describes in this book. Second, Ms. Chang's narrative voice was truly a pleasure to read. The material itself is fascinating and up-to-the minute-timely; the book details how a huge migration is taking place in China, transforming family life, economic life, and the individual fates of millions of young women and men who leave the countryside to work in cities full of factories, cities which are changing and growing at an insane speed. Knowing next to nothing about China, this book opened the door a crack for me to understanding something about the country. It was a great introduction, providing a context or anchor for further reading, and sparking my interest in learning more. Ms. Chang was the perfect narrator; she wrote in a way that provided an immediately familiar and recognizable narrative voice to an American reader but with her Chinese language skills, family background, open mind, and warm heart she was also able to become close enough with the Chinese women to give us an intimate view of their lives, ambitions, and view of the world. La Cina maoista è morta. Al suo posto, a partire dalle riforme economiche varate da Xiaoping negli anni '70, è sorta - in poche manciate di decenni - la "fabbrica del mondo", una nazione capitalista sempre più industrializzata e globalizzata, che si colloca alla sorgente di ogni commercio manifatturiero, ipercompetitiva e apparentemente onnivora. Tassello fondamentale di questo processo, dagli anni '80, è stato il surplus di popolazione che dalle campagne povere, non più necessarie alla produzio La Cina maoista è morta. Al suo posto, a partire dalle riforme economiche varate da Xiaoping negli anni '70, è sorta - in poche manciate di decenni - la "fabbrica del mondo", una nazione capitalista sempre più industrializzata e globalizzata, che si colloca alla sorgente di ogni commercio manifatturiero, ipercompetitiva e apparentemente onnivora. Tassello fondamentale di questo processo, dagli anni '80, è stato il surplus di popolazione che dalle campagne povere, non più necessarie alla produzione nazionale, si è spostato nei nascenti centri produttivi urbani, generando un flusso migratorio interno di quasi 300 milioni di persone - la stragrande maggioranza donne, giovanissime, povere, non istruite: ecco la fibra dell'ascesa cinese. E sono proprio queste donne "operaie" le protagoniste del monumentale romanzo-inchiesta di Leslie Chang. L'autrice le segue (perdendole, molte; ritrovandole, alcune) per circa tre anni, restituendone, con disinvoltura e una certa dose di freddezza, l'affannosa ricerca di una vita migliore, prese nelle maglie di un capitalismo spietato, di una cultura in dolorosa e conflittuale trasformazione, di una morale che stenta ad essere, ma che le vede innegabilmente protagoniste e artefici del proprio destino. Resta la domanda, inevitabile, pensando all'evoluzione storica del paese: è libertà, questa? Chang è incerta, non risponde. Vale anche per chi legge. Un libro illuminante, denso, divertente, costruito con la maestria di chi sa osservare fenomeni eccendenti e macroscopici, capirli, e farli capire. You might expect a book about the lives of migrant workers in China to be incredibly depressing, full of tales of abuse. This book isn't like that at all; it's informative, and doesn't gloss over ugly things, but nor does it beat you down. Factory Girls focuses on the lives of young women living in Dongguan, a huge city in southern China filled with factories and inhabited mainly by migrant workers. The author spent several years getting to know workers there, and most of the book tells their sto You might expect a book about the lives of migrant workers in China to be incredibly depressing, full of tales of abuse. This book isn't like that at all; it's informative, and doesn't gloss over ugly things, but nor does it beat you down. Factory Girls focuses on the lives of young women living in Dongguan, a huge city in southern China filled with factories and inhabited mainly by migrant workers. The author spent several years getting to know workers there, and most of the book tells their stories. But there's a lot of the author in the book as well; not just recounting her interactions with the migrant women (the migrant population in Dongguan is estimated at 70% female), but also tracing the history of her family in China, before they left for Taiwan and eventually the U.S. This book is certainly worth reading if you are curious about life in modern China; it's full of stories from the lives of the people Chang meets, as well as some broader factual information to give them context. Chang gets to know a couple of the women very well, meeting their friends and traveling home with them to visit their families. In a way, their stories are surprisingly positive; they seem very in control of their lives and able to pursue what they want from life, which is quite different from the typical industrial revolution story of oppressed workers. They change jobs frequently in search of better opportunities, they date, and they send home enough money to gain a voice in family affairs. But in other ways, the picture is hardly rosy: relationships don't last, everyone is obsessed with money, bosses often cheat their workers and corruption abounds. From a writing standpoint, the book is good: it's a smooth, easy read without feeling dumbed down, and the organization is clear. However, Chang made a couple of tricky choices that may impair some readers' enjoyment of the book. First, there's the decision to include so much of herself in the book, and stick scrupulously to events she witnessed and stories she was told rather than trying to draw broader generalizations. Sometimes I felt that the book could have used more breadth or depth, but ultimately Chang seems very careful to limit it to what she can discuss with authority. So, for instance, we get detailed accounts of events and conversations for which the author was present, which aren't necessarily earth-shaking, but which allow the reader to see where her information is coming from. Toward the end, she even admits that the two women she focuses on most may not be representative of most migrant workers, without suggesting how they might be different (for Dongguan, at least, both seem atypical in that they quickly moved up from assembly line work). Second, there's Chang's decision to write so much about her own family history and her quest to discover it, including her visits with long-lost relatives. She justifies this by pointing out that, like the workers' stories, it deals with migration; perhaps a better justification would be that it provides a historical context, and a contrast between people like her distant cousin who are stuck in the past and the young, ambitious women of Dongguan who are focused on the present and future. While I found the family history reasonably interesting, these sections ultimately seem a little too removed from the subject matter of the book, and cause it to be longer than necessary. The pacing for this book was entirely wrong. The setup and presentation of information was wrong. It seemed so helter skelter. The stories felt like they were vignettes, which I feel would have been a better choice for presentation, because they never felt like they flowed together. And then, then the book just ended. I couldn’t believe that it just ended. No summation. No wrap up. It felt like the end of just another vignette. At no point did I feel that the author had a thesis, or a guiding point, other than to tell these stories, and it left me, as the reader, feeling like I was just wandering through her book. These complaints aside, I think it’s (or maybe an abridged version) is an important read. China is huge, a vastly expanding commercial market, and producers of real to the most elaborate fake products ever. It’s a complete enigma to most Westerners, but its arguable a world power with an expanding military power. We need to understand where China has come from, where she and her citizens want to go in the future. It’s definitely an eye opening work that will make you think twice about American standards of construction, work ethic, production, and consumption, and as we enter the holiday season- these are not bad things to think about and be grateful for. Some people, when they travel, are most amazed by the differences they find ... the donkeys, the tuk-tuks, the rat-on-a-platter, the strange drinks and weird foods. Others are most taken aback by the unexpected similarities: the corn farmer with a cell phone, the slum dweller playing Grand Theft Auto 4, the kids who rock out to punk and metal. The best travel writers and foreign reporters, though, simply see. This is a splendid, splendid book. It's not only better than I expected, it might even Some people, when they travel, are most amazed by the differences they find ... the donkeys, the tuk-tuks, the rat-on-a-platter, the strange drinks and weird foods. Others are most taken aback by the unexpected similarities: the corn farmer with a cell phone, the slum dweller playing Grand Theft Auto 4, the kids who rock out to punk and metal. The best travel writers and foreign reporters, though, simply see. This is a splendid, splendid book. It's not only better than I expected, it might even be better than it has any right to be, because it so easily could have been awful. It so easily could have been another why-China-will-rule-the-world book, or another how-the-West-is-ruining-the-East book, or even--since the author weaves the story of her own family's immigrations into the larger story of the current mass migration from farm to factory--another ersatz Joy Luck Club wannabe about how tough it is to be Chinese. Instead, it's a perceptive, funny, sympathetic, and often deeply moving story of forgotten people and forgotten histories. Chang, in profiling the women who come from rural China to the bustling factories of the southern provinces, provides a compelling narrative of the way that the people of China are trapped between the excesses of the Cultural Revolution and those of unfettered hyper-capitalism, and she does so in a way that is critical and clear-eyed, yet refrains from easy potshots and sweeping judgments. If Factory Girls is a little short on analysis, it is full of insight. It is also surprisingly well written ("The houses of Liutai sat amid rolling hills, each one set apart from the next and facing a different direction, like a fistful of dice flung across the valley"); its final paragraph reminded me of nothing so much as the lovely, elegiac ending of A Bend in the River, also a fine book about being far from home. I expect more good things from Ms. Chang. She is a writer who sees. I was very disappointed in this book. It was very disorganized. The descriptions and conclusions also seemed very superficial. I chose the book because I was very interested in learning about life in China I was very disappointed in this book. It was very disorganized. The descriptions and conclusions also seemed very superficial. I chose the book because I was very interested in learning about life in China today. I stayed with it to the very end hoping I'd learn more, but nothing more ever came. When I finally finished I felt I'd wasted my time and wished I quit sooner. For me this book felt like a gentle drenching in the culture of Dongguan - a city that grew up from small sweatshop factories and burgeoned into a town of massive enterprises, sucking in migrant workers from rural villages hundreds of miles away. Seventy thousand people now work at the Yue Yuen factory in Dongguan. "Inside the compound's brick walls, workers sleep in factory dorms and eat in factory cafeterias and shop at factory commissaries. Yue Yuen runs a kindergarten for employees' children For me this book felt like a gentle drenching in the culture of Dongguan - a city that grew up from small sweatshop factories and burgeoned into a town of massive enterprises, sucking in migrant workers from rural villages hundreds of miles away. Seventy thousand people now work at the Yue Yuen factory in Dongguan. "Inside the compound's brick walls, workers sleep in factory dorms and eat in factory cafeterias and shop at factory commissaries. Yue Yuen runs a kindergarten for employees' children and a hospital with a 150-member staff; it has a movie theater and a performance troupe, volunteer activities and English classes. It operates its own power plant and fire department...."
When Yue Yuen set up its first factory its employees often had to work until midnight, and they only got one day off a month. Then big American brands like Nike and Adidas were chivvied in the West about the bad working conditions in the factories belonging to their producers. In response Yue Yuen changed to an eleven hour workday, and gave its workers every Sunday off... but other things changed for the worse. In 2001 Adidas initiated a programme called "Lean Manufacturing" to increase efficiency and decrease waste. Not only did this put more pressure on the workers - with tasks precisely designated and little downtime, but workers were no longer allowed to share dormitories with friends....instead they had to share with assembly line colleagues. Life in most of the big factories appears vast, impersonal and pressured - but in fact the people working there sound far from cowed by their situations. Throughout the book we hear about people moving onto new jobs at the drop of a hat, happily falsifying information about past work experience and skills in order to get better jobs. Many of the people interviewed seemed fantastically ambitious and enthusiastic. Ambitious to earn more, to learn better social or business skills, and to learn English. (English sometimes taught in extraordinary ways!) It seems a lonely life though - with people moving all too easily in and out of one another's lives. Several times the author talks about friendship links being tenuous - with contact information only kept on mobile phones. Lose your phone, lose your friends. There is another huge aspect to this life though, and that is the rural culture that most of these people come from. "The continuing link to a family farm has stabilized China in an age of mass migration. Its cities have not spawned the shantytown slums of so much of the developing world, because the migrant who fails in the city can always return home and find someone there. A teenager may go out for work, leaving his parents on the farm. A husband who migrates may have a wife at home tilling the fields, or sometimes the other way around. A married couple might go out together, leaving young children in the care of their aged parents. In the city, a migrant may look desperate, but almost every migrant has a farm to fall back on." All the young people interviewed in this book were sending money home to their parents in the countryside. In one instance the author accompanies one of the girls back to her country home. Hours of cramped and uncomfortable travel by train, and at the end of it - some incredibly basic conditions. A family of people sharing beds, sharing washing water, and unwanted waste just dropped on the floor. I was amazed that such an ambitious work ethic could have blossomed in such circumstances, but the desire to better oneself seemed a burning issue for most of the workers. Back at the factories there is much duplicity and corruption - pyramid schemes, often involving gullible factory workers,or pay-offs to buyers at factories and suchlike. All of this is perhaps exacerbated by the incredibly low wages that the workers get. Another thing that stuck me was the incredible urge for business that everyone seems to have, with every opportunity for investment or diversification leapt upon. Uno dei libri più interessanti dell'anno e di sempre è questo saggio/reportage. L'autrice segue le vite di due ragazze emigrate dalle zone rurali della Cina verso una delle metropoli industriali del sud e contemporaneamente racconta la Cina contemporanea -che ti distrai un secondo ed è già cambiata. La città è Dongguan, 10 milioni di abitanti, parte della "provincia" di Guangdong, un'immensa megalopoli industriale di 100 milioni di abitanti più 30 milioni stimati di migranti non censiti. Di cui i Uno dei libri più interessanti dell'anno e di sempre è questo saggio/reportage. L'autrice segue le vite di due ragazze emigrate dalle zone rurali della Cina verso una delle metropoli industriali del sud e contemporaneamente racconta la Cina contemporanea -che ti distrai un secondo ed è già cambiata. La città è Dongguan, 10 milioni di abitanti, parte della "provincia" di Guangdong, un'immensa megalopoli industriale di 100 milioni di abitanti più 30 milioni stimati di migranti non censiti. Di cui il 70% sono donne. Come cambia la vita di una ragazza che abbandona il villaggio per cercare lavoro in una megalopoli industriale? Si passa dall'inerzia del villaggio alla frenesia metropolitana, dal non avere un lavoro a cambiarlo ogni 6 mesi, dall'essere parte di una comunità all'essere un'individuo, dal non avere un soldo ad averne tanti, dal non poter scegliere al dover scegliere continuamente, dall'avere amici e parenti a poter contare solo su di sé e abituarsi a perdere periodicamente ogni riferimento. Si scappa dal villaggio, si pensa sempre al villaggio, si torna al villaggio e si scopre che il villaggio non ti appartiene più -la migrazione è un viaggio a senso unico, il cambiamento che la metropoli impone rende impossibile il ritorno. I acquired this little book last year from a local library that has piles of English books particularly and neatly stacked up in a room, quite cozy and convenient for readers who like to be more bilingual （like me）. The protagnists are those migrant female workers, the young girls who fleed their imporverished rural villages in quest of a better city life. The book primarily covered a period from late 90s and early 00s. At a time particularly in 90s, if they strive for something new they need to c I acquired this little book last year from a local library that has piles of English books particularly and neatly stacked up in a room, quite cozy and convenient for readers who like to be more bilingual （like me）. The book primarily covered a period from late 90s and early 00s. At a time particularly in 90s, if they strive for something new they need to challenge and break the bonds of the old world and traditions where their options are extremely limited. Most girls would end up being married at young age and their fates are mostly set . There is no other alternative if not choosing to go outside. What impressed me most was author mentioned that when rural teenagers were trying to do something new and desperately in need of life guidance their parents will invariably and inevitably offer the worst advice. They were never privileged to attain favorable guidance as their urban peers did. Dreams are great but the reality won't always offer them romantic answers. Almost poorly educated, Village girls ,if not most of them, would end up as workers in those obnoxious sweatshops. I swear you were not rare to see those reports on incessant cases of jumping-off-the-roof stuff in some or other of those factories a few years ago even you didn't pay much attention to China. Things transformed a bit these years but the “constructive conflict” still taneciously persists in modern China with the fact that rural people , migrant workers included, never can access to an identity belonging in cities however hard they try, however affluent they may be. The book succeeded in exposing the real life of individuals instead of focusing on the big picture of social transformation.I love the way the author drawing us a bittersweet picture through the eyes and experiences of insignificant individuals like most Chinese people ,like me.. But the defects are also noticeable. The book seems not have arranged its chapers chronologically , which made me kindof bewildered and excruciating. Journalist Leslie T. Chang tracks the lives of several factory girls in this work, including Min and Chungming, two young women who live in a "perpetual present" in Dongguan, China. Her deep dive in these women's lives illustrates the situations in which they are exploited as cheap labor but also highlights how these women manage to carve a place in the world outside of the village lives of their mothers and grandmothers. If you have ever wondered about the people who make most of the objects we use on a daily basis – like running shoes, home appliances, kitchen utensils... read this book. We are given an insightful view of their lives and surroundings. Most of them are young women who come from rural areas. They essentially abandon the rural lifestyle to embark on an urban factory journey. Most will change jobs several times. They will meet a myriad of friends who just come and go. Their lives are forever altered. The author does not wage a campaign denigrating the factories young people work in. We are presented rather with their daily living conditions. They work long hours and they are exploited – if they leave the job they may not receive the back pay owed to them (like two months wages). One of the first things that hit me when starting to read, were the job ads specifically asking for “female workers”. In my country (Canada) it would be against the labour code to specify a gender when posting an ad (not that jobs in Canada do not discriminate by gender – construction jobs are male dominated, CEOs are predominantly male). Importantly the author visits a village, that some of the workers come from, during the New Year vacation period. We feel the contrast between what the young girls’ life in the village would be like with constricting and defined roles around the family, the extended family and the entire rural community. In the factory they have more empowerment – they can ask the boss for a change of position, a raise, or even quit. They can spend their earnings as they wish. They also sense their empowerment when they return to their small community – which aside from the electronic gadgets seems almost medieval; there is no sense of privacy. Neither does Ms Chang paint the urban factory as a paradise. There is a constant pressure of production – of doing more with less, and also dishonesty between all levels of the workers and employers . We are told for instance that theft is common in the worker bunk houses. Also I got a pervading sense of loneliness,but loneliness is common in the urban environment. So many people, but so few real friends. I titled this review “Debrouillez-vous” which is a French expression meaning – get on with it, make due, you are on your own. This, I believe, describes the plight of these young girls when they arrive in Dongguan – a huge land of factories – where they must organize themselves, get a job, change jobs – all on their own – and become self-reliant. They are no longer in a communal village. This is a revealing book and focuses on people – not statistics – so we get a personal view of some of the factory workers – mostly female but young men as well. One statistic does stand out – 130 million migrant workers – the population of my country (Canada) is somewhat over 30 million. That is a staggering number! Perhaps I would have liked more on sexual harassment – after all most of the workers are young women and their bosses male. We are also provided with a chapter on the ubiquitous running shoe. This is a very worthwhile read – up close, engaged and personal. Page 57: If migration liberated young women from the village, it also dropped them in no-man’s land. Page 97: In a universe of perpetual motion, the mobile phone was magnetic north. This book is a bit hard to review because it is somewhat more complex than one would first expect. The story turns out to be a bit different than the preconceived notion also. probably the least biased newspaper in America and this gave her the mindset and habit to write an interesting and unbiased account of this unusual mass migration from rice patty to factory. She also integrated her life with her subjects to an unusual deg This book is a bit hard to review because it is somewhat more complex than one would first expect. She also integrated her life with her subjects to an unusual degree which gave her more information and allowed her the chance for personal growth and self understanding. One gets the impression that previous to writing the book she ignored the Chinese aspect of her personal history, but in spending so much time with ambitious Chinese girls, she came to see a side of herself she had previously ignored. The author comes across as a bright, spunky, likeable person so this helped to make the book an interesting read. She lists quite a few interesting observations about Chinese behavior that are good too. The 70 pages of personal family history was unexpected and while it probably made her parents happy, the book would have been better without that. but no indoor plumbing or heating, so they have to stand up and jump around to stay warm while watching it. One funny account of bathing in the country. "the women of the family would heat a basin of water. One after another they washed their private parts and feet, without changing the water in between. Then the men would refill the basin and do the same. Every so often, the family members took a sponge bath, but that was usually different from the once in many days they washed their hair. Eventually every part of the body would be clean, although rarely at the same time." Most accounts tell of the low pay and long hours, they make it seem like the poor girls live a life of misery. But throughout the book one feels that the girls don't feel that way, instead they look to the future with optimism that with each year their life is getting better and that they have more choices. and except for one adult man who is fighting the government about a grievance from long ago, there are no sad sacks or whiner's in this book. Just a hoard of ambitious people relentlessly pushing ahead with high expectations. The major disappointment is that except for one photo on the back cover there are NO photos. The dorms & lunchrooms they live in, the factory floor, the train stations, the farm back home, a hundred interesting images that one can only imagine. and 20 years from now it will again be so different. A photo record of this transformation is needed. An account of girls moving from rural areas to the big cities for better opportunities, a universal story that could be told in different countries and by many women, including my mother. The first bit of this includes the fairly brutal factory conditions, the chaotic hiring practices and poor living conditions, mill girls from the 19th century gave similar accounts, the Chinese version has been in the news lately. Next the author gives an account of her grandfather's quest for education that in An account of girls moving from rural areas to the big cities for better opportunities, a universal story that could be told in different countries and by many women, including my mother. The first bit of this includes the fairly brutal factory conditions, the chaotic hiring practices and poor living conditions, mill girls from the 19th century gave similar accounts, the Chinese version has been in the news lately. Next the author gives an account of her grandfather's quest for education that includes college in America and a beating given by his father for changing majors and his murder by persons unknown. His devotion to his country is shown thru diary entries and is contrasted later with the modern migrants who are more self-centered. The story of part of the family fleeing the Communists and some staying behind is also retold. Following this is a bit that covers the self-help industry, pyramid scams, inferior almost cult-like schools mixed in with some dating practices. This section explores the fakery and fraud that is so much a part of the factory subculture in China. Forged IDs and credentials are common, lying about your age, phony dating pictures, nothing seems real. I've been told that there's a saying, everything but your mother is fake , this conveys the levels of deception encountered. Next the author goes to the villages of some of her friends and shows what these girls are fleeing from; poverty, poor schools and patriarchy. It then gets you thinking, are those factory life styles really that bad compared to the alternative? Among my many Chinese friends and coworkers I have never talked to anyone not from an educated middle class or better background except for brief phone conversations along the lines of You want massage?, so this bit was fascinating. This is contrasted with her trip to her own village where no members of her family reside and only few locals remember them. When my sister asked what I was reading recently, I told her it was a book about Chinese factory workers. “God, you’re worthy,” she replied scathingly. But the thing is – despite its worthy subject matter and uncomfortably small print – Factory Girls is actually a highly enjoyable read. Providing a flipside to all those “terrible working conditions, suicides, general calamity” articles about manufacturing in China, Leslie T Chang seeks to find out more about the average Chinese factory worker on a When my sister asked what I was reading recently, I told her it was a book about Chinese factory workers. But the thing is – despite its worthy subject matter and uncomfortably small print – Factory Girls is actually a highly enjoyable read. Providing a flipside to all those “terrible working conditions, suicides, general calamity” articles about manufacturing in China, Leslie T Chang seeks to find out more about the average Chinese factory worker on a very human level. What she finds is, yes, long hours and exploitation for many. But she also finds a number of spirited, ambitious young women whose lives are surprisingly easy to relate to. Through these highly-personal stories, Chang draws out some very interesting analysis of Chinese culture and society in the 21st century. The book’s only misstep, in my opinion, is Chang’s decision to include lengthy digressions into her own family history. It felt a little like Chang was trying to research her family tree on her publisher’s dime. Leslie Chang is a newspaper writer, not a novelist, and it shows in her first book. Though the subject matter is fascinating (an entire generation of Chinese children abandoning their farm lives to make money in the clogged, smoggy cities), Chang's details often get jumbled. In the same paragraph, she will jump forward and backward in time. I found some of this very confusing; she apparently hates chronological order. Plus, she interjects a heavy dose of her personal family history, ostensibly t Leslie Chang is a newspaper writer, not a novelist, and it shows in her first book. Though the subject matter is fascinating (an entire generation of Chinese children abandoning their farm lives to make money in the clogged, smoggy cities), Chang's details often get jumbled. In the same paragraph, she will jump forward and backward in time. I found some of this very confusing; she apparently hates chronological order. Plus, she interjects a heavy dose of her personal family history, ostensibly to further illustrate the true intentions and terrors of Chinese migrants throughout generations. But rather than add to her story, these family tales bored me. I really don't care about how your grandfather gave up a good job to come to American in 1911 - I care about current Chinese women in factories. Đó là một buổi trưa trời nắng đẹp và tôi đi bộ từ ngoài cổng trường vào nhà A. Để vào toà nhà, tôi hay đi con đường dốc thoải thoải, mà cho tới giờ, khi có mặt ở Úc rồi, tôi mới nghĩ là "có thể đó là đường mà kiến trúc sư xịn của trường mình thiết kế ra để cho người tàn tật đi". Hôm đó ở đỉnh dốc, (gọi là dốc thôi chứ người ta hay ngồi bạ ngồi bừa ở bất kỳ chỗ nào trong sự thoai thoải đó), H ngồi, đang đọc một cuốn sách mà cậu đã giới thiệu cho tôi vài ba ngày trước đó. H đọc đầy đam mê, như các Đó là một buổi trưa trời nắng đẹp và tôi đi bộ từ ngoài cổng trường vào nhà A. Để vào toà nhà, tôi hay đi con đường dốc thoải thoải, mà cho tới giờ, khi có mặt ở Úc rồi, tôi mới nghĩ là "có thể đó là đường mà kiến trúc sư xịn của trường mình thiết kế ra để cho người tàn tật đi". Hôm đó ở đỉnh dốc, (gọi là dốc thôi chứ người ta hay ngồi bạ ngồi bừa ở bất kỳ chỗ nào trong sự thoai thoải đó), H ngồi, đang đọc một cuốn sách mà cậu đã giới thiệu cho tôi vài ba ngày trước đó. H đọc đầy đam mê, như cách tôi có thể cảm nhận được qua những lời khen đậm đặc mùi xuýt xoa của cậu. Tôi tính ngó qua chào một câu, và lên lớp, nhưng khi ngồi cùng H rồi, cậu nói tôi ngồi lại bên cậu một chút. Và đó là tất cả những gì tôi nhớ lại về "Gái công xưởng" trước khi tôi quyết định sẽ đọc cuốn sách ở bên này, bản tiếng Anh, giữa những chộn rộn về nữ quyền, năng lực lãnh đạo, giữa tình yêu mới và những điều mới mẻ khác. Những ngày đầu đọc sách cũng là những ngày đầu tôi bắt đầu đi làm ở một nhà máy, với vai trò công nhân. Tôi, lúc đó, cũng là một gái công xưởng. Nhưng ở một quốc gia khác. Ở một chế độ khác. Một hệ thống khác. Phong cách khác. Vậy nên đọc Gái công xưởng, phần nhiều tôi nhảy sang một bên của diễn biến nhân vật, để nghĩ về mình (cũng là gái nhà máy của vài ba năm về trước), rồi lại là mình của một vài năm sắp tới. Gái công xưởng quả tình tới giờ không xuất sắc như ngày đó tôi mường tượng (qua những cái xuýt xoa của H, chuyện này xin đổ lỗi cho H), nhưng mang lại cho người đọc một cái nhìn nhiều vị mặn về một góc không hề nhỏ của thế giới, khi mà chuyện biết viết (và viết đep), cũng là một giá trị cao cấp. LOL this is my longest review ever, but it is because I was so engrossed in it! I loved every page, every story, and I loved being able to glimpse into the rare world told from a compassionate view and not an economical study of China feeding the world with materialism. In fact, that is briefly mentioned -- instead it is a message of promise and hope. I did NOT want this to end. This book is beautiful, and it is written through the eyes of someone who stands on the border of being American, and c LOL this is my longest review ever, but it is because I was so engrossed in it! I loved every page, every story, and I loved being able to glimpse into the rare world told from a compassionate view and not an economical study of China feeding the world with materialism. In fact, that is briefly mentioned -- instead it is a message of promise and hope. I did NOT want this to end. This book is beautiful, and it is written through the eyes of someone who stands on the border of being American, and confronting their own Chinese past. It covers the controversial themes of Chinese factory workers, but while it gave the facts and the figures of what really does happen in factories, the workers and their lives are the main heart of the story. It gently explains the political friction from the cultural revolution vs. traditionalist farmers who have been literally practicing the same habits for centuries and now are at odds in bettering their lives. In this day in age, the only way for many to better their circumstances is "to go out" and migrate to the south east industrial areas of China. Many times the parents stay home on the farms, some may go out, but mostly the children who do not make it into college (which is the majority due to lack of opportunities), leave for the factory cities. It is here these "migrants" consisting of women and men (mostly 18+, but some are underage with the purchase of black market documents) who were once so protected in their isolated villages now face an unforgiving, competitive territory alone. Many will spend their lives on the factory assembly lines working most days with few days off, sleeping in the factory dorms, and sending all their money back to their families. The factories thrive on the youngest, so many spend their youth working. Others are tricked (schemes are rampant) or simply fall into the easier lifestyle of prostitution. Some try to get in on ponzi or get rick quick schemes, and others just retire home and settle back into their villages and get married, no better than they started. A select few take the assembly lines as a stepping stone to use their wages to better themselves via skill and language classes, and even blatantly learning to lie in order to sell themselves into higher positions. Some of these girls are determined to better their lives through their job and income, which in China also means raising marriage prospects, and status through rising over the majority. Some make it, some just go home, others never give up trying. The book is written literally as the author lives through the events, and she follows two of these girls (whom you grow to cheer for) through their working lives who become her friends. She also treats us to a view in one girl's village when she accompanies a girl home for the new year. Parents who once kept women isolated, now send them out. With this is also the constant nagging of the girls to come home soon and marry, yet also they demand they send home more money. It is a frustrating situation for the girls who have now learned what the great outside is really like, and it is inevitable that in only a few years a huge culture gap appears. Girls jump from place to place to get experience in order to rise higher, parents discourage this in girls, calling them too "flighty". Girls who often work hard most of the time, might treat themselves to something fashionable, lip gloss, a mobile phone, or even time with friends, while have their parents chide them for sending home too little money. All it takes if one is unhappy is to leave, which is a constant in these girl's lives. Many will be invested somewhere and leave to become a different person the next day. This means constantly changing friends, daring to date men from different provinces (a Chinese family's worst nightmare). Many times the girls are working to send money home in order for the family to raise the other children, or extend their family home for the boys in the family to marry in wives. It is no surprise the girls end up lying in order to balance their families needs and the destiny they are daring to dream of for the first time. Many girls even manage the ultimate dare: to open up a bank account of their own. Others are not so lucky, and their fathers have the factories pay it into the family account. The other part of the book goes into the beautiful but tragic history of the author, who describes herself reluctant to "China's pull", but eventually gives in. While working as an American correspondent for the Wall Street Journal, not only does she follow these girls, but she finds her own past that began with migration itself. This is a one of a kind book, there is no slow beginning, their is no abrupt end, and as you close the book you realize this journey is still going on. It was then that I realized for the first time I enjoyed the whole journey, and wanted more. Usually in books there are parts that slow down, parts that are exciting -- this really is about the journey and not the destination that makes it so beautiful. --employers withhold the first two months of a worker's pay, and one who leaves without approval (which is difficult to obtain) means forfeiting this money. Nonetheless this often happens, if better positions are available, as climbing the ladder from floor worker to supervisor or especially positions like secretary is well worth it. --money sent home is the largest source of wealth accumulation for rural families. In contrast with prior generations of migrant workers, women (or, really, girls, as they are quite young) who leave home now rarely return to farming permanently, as they never knew this life previously. Older generations care for younger children and harvest the fields. However, the rural lifestyle does provide a safety net for workers, and the author postulates that China does not feature the shanty towns prevalent in other developing (or for that matter developed) countries because of this safety net. --Also in contrast with previous generations of migrant workers, today's do not face the same sort of intimidation from police, or discrimination, because in many towns they are now the overwhelming majority of factory workers. --Based on working conditions, European- or American-owned factories are most preferred, followed by Japanese, Korean, Hong Kong, Taiwan, and finally domestic companies. --70,000 people work at the Yue Yuen shoe factory, which makes athletic shoes for several major manufacturers. When Nike and Adidas came under pressure to improve working conditions, they went to an 11-hour workday at the factory, and gave workers Sundays off--but this prompted many workers to quit because they could no longer get enough overtime. I thought this was an interesting microcosm of the problem of imposing developed-world values onto the developing world. "An incident from half a century ago would be recalled differently, with each person's version fixed and distinct--pieces of China they carried with them that had hardened over time, like precious pebbles worn smooth." "Zhao sat perfectly straight on the couch--as stiff-backed as a young cadet, and arrogant in this knowledge. Silently he pointed to himself, his thumb aiming at his chest like a dagger that has found its target." "The Cultural Revolution took everything the Chinese people had long held sacred and smashed it to pieces, like an antique vase hurled against the wall." I suppose for a reader not yet familiar with China, much of this book content would be quite shocking and enlightening. I did not particularly feel that way, yet still there are many insights worth reading. The main focus of the book, these factory girls, or we should rather call them migrants (since at first I mistook the word "factory girls" for workers on assembly lines only), are fascinating. Instead of knowing them through the usual presentation of statistics, numbers and graphs, plus some I suppose for a reader not yet familiar with China, much of this book content would be quite shocking and enlightening. I did not particularly feel that way, yet still there are many insights worth reading. The main focus of the book, these factory girls, or we should rather call them migrants (since at first I mistook the word "factory girls" for workers on assembly lines only), are fascinating. Instead of knowing them through the usual presentation of statistics, numbers and graphs, plus some sensational stories, Leslie Chang simply looks into several ordinary girls that she seems to stumble upon by complete chance. After getting to know these migrants, we find them not so ordinary anymore, we find them, in fact, extra-ordinary, in both good and bad lights. These stories are the ones that draw me most, their emotional struggle, their pragmatic dealing with the world they live in. Unfortunately, I find the structure of the book quite frustrating. To the book's credit, I realize life is not so easily categorized and ordered into separate aspects, such as work, study, marriage, family. And none of these girls' stories are complete, so it is after all an endless struggle, with repeated occurrences of many issues. Nevertheless, I think the book could be trimmed down and ordered more effectively. I am not that interested in looking at Chang's comments on national characteristics, the "Chineseness" of many things she found in the country. I am deeply skeptical about thinking there is a unique "essence" that marks the difference of one group of people to all others. As if some of their experiences are true to them only, as if some resulted reactions could happen to them only. It shares some shortcomings with How We Survived Communism and Even Laughed, I think. No, my personal belief, that if you have a lens large enough to look at a wide span of history, you would find humankind is pretty much universal. We find ourselves in many other people throughout history. The circumstances are not exactly the same, but there are ones very similar. Yet, we tend to exaggerate what we find as special. I am not that interested in Chang's personal family history and her quest to reconcile with a home she had not known for many years. The connection between her story and those of factory girls seem a little bit stretched and very much personal. They are not really meaningful connection to me, but surely to the author since she could better make sense of her world. This is a novel one can spend hours contemplating. The development of factories in China is often compared to our own Industrial Revolution. It is similar yet different in many ways some of which are cultural, some of which are born of necessity. It's fascinating to follow the migrants who move into the cities from their rural origins. The author discusses migration of young women from the countryside to the city where they seek jobs in the factories in Dongguan. She tells stories about several This is a novel one can spend hours contemplating. The development of factories in China is often compared to our own Industrial Revolution. It is similar yet different in many ways some of which are cultural, some of which are born of necessity. It's fascinating to follow the migrants who move into the cities from their rural origins. The author discusses migration of young women from the countryside to the city where they seek jobs in the factories in Dongguan. She tells stories about several individuals, some she loses and some she keeps as friends. She quickly loses Yongxia and Dali among the thousands seeking work. Min becomes almost a friend. Many young women like Min job hop, attend classes, look for love and hope for better jobs and more money but are often taken advantage of by others. To understand these young migrants one must know a little about the factories themselves. "It takes two hundred pairs of hands to make a pair of running shoes." Thus begins the chapter describing Yue Yuen, a factory where shoes are made. The author describes the factory itself, its conditions and talks to workers. Self-improvement is a way of life for many of them. It's how the differences between the young migrants and their families begin. Many have little education and expect to learn on the job. Falsifying qualifications, age, and experience is common. At some point after "going out" (working in factories) young migrants begin to seek mates. The author attends meetings of a club to aid the process. It is poorly operated. She meets Wu Chunming with whom she spends a good deal of time, trying to understand how she will find a husband. She reconnects with Min who takes her to her parents' home for two weeks over the Chinese New Year. There is so much information in this book that I can only relate a few instances of my impressions. When the author switches tactics to pursue her Chinese heritage background, she discovers much about her family, how they suffered during the cultural revolution and how they scattered across the country and to America. She learns that the family histories which survived the cultural revolution extend for hundreds of years beginning with the migration of the first ancestor but many have been destroyed. Fortunately, hers was saved by a family member who became obsessed with what happened. Within the final pages of this investigation she links her discovery to the stories of Chunming and Min, the migrant girls she came to know best during her research for this novel. It's a read I recommend to those who wish to learn more about this vast country and its people. Listened to this on audiobook while jogging. It was long and could've used some editing, I thought--particularly with the long sections detailing the author's ancestor's stories and history. I suppose some would find that part interesting or enlightening but I just thought it distracted from the main story in an already long book. The "main story" being the factory girls. Now I thought the factory girl stories were really interesting. First of all, I had always pictured Chinese factory workers as Listened to this on audiobook while jogging. It was long and could've used some editing, I thought--particularly with the long sections detailing the author's ancestor's stories and history. I suppose some would find that part interesting or enlightening but I just thought it distracted from the main story in an already long book. The "main story" being the factory girls. Now I thought the factory girl stories were really interesting. First of all, I had always pictured Chinese factory workers as submissive, abused indentured servants who had to keep quiet and just be happy to have their menial, overworked and low-paying jobs. But it was not the case, at least not with the women featured. They yelled at their bosses, quit at the drop of a hat, faked ID's to get work, faked diplomas to get work, and ambitiously elbowed their way into better positions. I was impressed. I was also interested in (but not too surprised by) the level of corruption that goes on. Faking diplomas and ID's to get jobs is completely widespread, and as the authors and her subjects pointed out, if you don't do it too, then you are just going to lose out to those that do. Endemic lying is widespread. Nobody checks references and everybody lies about their past work. Also kind of shocking are the fact that job ads say "for women only" or "for men only", specify minimum height requirements, and include alarming things like "No skin sensitivity." I mean, what does THAT mean?? Scary! So I thought it was an interesting read, about a country that is quickly becoming one of the world's fastest-changing and more significant/important growing powers. "Factory Girls" is a non-fiction look at young women in China who leave their rural homes in order to forge a better life in the factory boomtowns of their country. As the book shows, the life in the big city is not always what it's cracked up to be for these young women. The hours are long. The wages are low. The work can sometimes feel like indentured servitude. This book gave me a glimpse into a world that I was not familiar with at all. I love non-fiction books that focus on people and place "Factory Girls" is a non-fiction look at young women in China who leave their rural homes in order to forge a better life in the factory boomtowns of their country. As the book shows, the life in the big city is not always what it's cracked up to be for these young women. The hours are long. The wages are low. The work can sometimes feel like indentured servitude. This book gave me a glimpse into a world that I was not familiar with at all. I love non-fiction books that focus on people and places that I know little to nothing about. I love getting a glimpse at how others live. Although, I love international news and politics, I had never thought about who exactly is working at all of those huge Chinese factories that so many of the goods that we use come from. This book definitely gave me an appreciation for the choices that I had as a young 20 something year old. These are not the same choices that the women in this book had. This book tells the story of the everyday lives of the workers in China's factories, the majority of whom are young women 18-25, who have left their rural villages in hope of a better life. The author also follows the lives of two of these young women over the course of three years of their lives. Getting into a factory is easy, what is harder is getting out. Employers often withhold up to 2 months of pay, and if an employee wants to quit, they face losing that pay if the employer does not want t This book tells the story of the everyday lives of the workers in China's factories, the majority of whom are young women 18-25, who have left their rural villages in hope of a better life. The author also follows the lives of two of these young women over the course of three years of their lives. Getting into a factory is easy, what is harder is getting out. Employers often withhold up to 2 months of pay, and if an employee wants to quit, they face losing that pay if the employer does not want to let them go. Most workers live in dormitory type rooms at the factories; one factory, which employs over 70,000 people, even has its own hospital. But still, most of the young workers, in spite of the low pay and long hours, see work on the assembly line as way to a better life; it's still more money than they would have been able to earn staying in their villages. A lot of the young women are able to work their way to office jobs within the factories. Even after long 12 hour shifts, many will take classes after work ends for the day, including learning English, to enable them to have a better future. The author also weaves the story of her own family history throughout the story, which provides a contrast between the values and attitudes of more traditional times, to modern times. 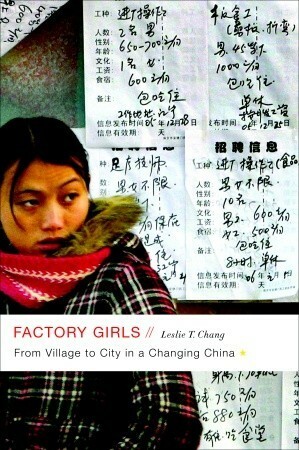 In 'Factory Girls', Leslie unfolded the desperate life of female migrants in China's industrial cities. The book had a great beginning with many real-life accounts of young girls working in sweatshops in China. Those were the young and ambitious women who worked stressfully in assembly lines, who found themselves tangled in danger of being exploited and assaulted, and who had to depend on no other than themself to break away. Sadly, there were just few of them who managed to create their own new In 'Factory Girls', Leslie unfolded the desperate life of female migrants in China's industrial cities. The book had a great beginning with many real-life accounts of young girls working in sweatshops in China. Those were the young and ambitious women who worked stressfully in assembly lines, who found themselves tangled in danger of being exploited and assaulted, and who had to depend on no other than themself to break away. Sadly, there were just few of them who managed to create their own new future while the rest of them were still struggling behind the walls of factories. All stories were vivid. However, it would have been an excellent book if Leslie had not spent too much time explaining the rationale behind her hatred of the communism. She lamented the miserable history of her family. She lectured unnecessarily on Chinese history. She regarded bitterly that the communist party ruined her family. She blamed the communist government for causing the deprivation of the migrants. In short, the personal issues prevented her from accepting the fact that though migrant issues could vary by country, they were fundamentally the same despite whatever ruling party. A little longer than it needs to be but it's very enlightening. It really makes you realize how fortunate we are to be employed or even unemployed in the USA. These girls leave home as young as 14 and are hired at talent markets so they don't even see the conditions of the factory until the first day on the job. They also live at the factory, sleeping in dorms. Working from 8am to midnight with two short (10 minute) breaks is not unheard of. Employers also withold pay so they cannot quit without A little longer than it needs to be but it's very enlightening. It really makes you realize how fortunate we are to be employed or even unemployed in the USA. These girls leave home as young as 14 and are hired at talent markets so they don't even see the conditions of the factory until the first day on the job. They also live at the factory, sleeping in dorms. Working from 8am to midnight with two short (10 minute) breaks is not unheard of. Employers also withold pay so they cannot quit without permission. If they walk off they lose all their back pay. One factory told their employees that their client was behind in payments so they were docking all employee wages by 30% until the debt was paid. Don't even get me started on discrimination. I could go on and on but you really need to read the book. The author gets to know some of the girls quite well. there are chapters on the dating life, learning English, etc etc and she even reveals a bit of her own dynamic Chinese history. Leslie T. Chang lived in China for a decade as a correspondent for the Wall Street Journal, specializing in stories that explored how socioeconomic change is transforming institutions and individuals. She has also written for National Geographic. Factory Girls is her first book. A graduate of Harvard University with a degree in American History and Literature, Chang has also worked as a journalist Leslie T. Chang lived in China for a decade as a correspondent for the Wall Street Journal, specializing in stories that explored how socioeconomic change is transforming institutions and individuals. She has also written for National Geographic. Factory Girls is her first book. A graduate of Harvard University with a degree in American History and Literature, Chang has also worked as a journalist in the Czech Republic, Hong Kong, and Taiwan. She was raised outside New York City by immigrant parents who forced her to attend Saturday-morning Chinese school, for which she is now grateful.